In the minute following switching off of the ignition, any action on the stalk positions the wipers vertically. 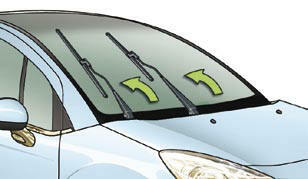 This action enables you to position the wiper blades for winter parking, cleaning or replacement without damaging the bonnet. To park the wipers after this has been done, switch on the ignition and operate the stalk. - avoid using them to retain cardboard on the windscreen.